. . . Stunned resident of Kizel, in the county of Perm, recorded the footage (below) showing strange occurrences in the night sky, apparently filmed in March 2015. 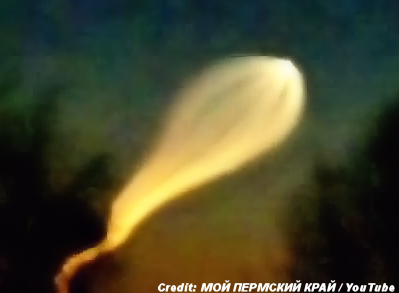 The video title, originally in Russian, describes it as a "fixed launch UFO", although many commenters were quick to offer their own explanations. Many postulated it may have been a missile launch, citing specific types of weaponry with distinctive trails, including the Soviet-era Topol M intercontinental ballistic missile. . . .